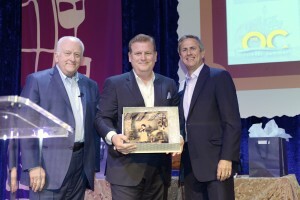 NEWPORT BEACH, Calif. – The Orange County Visitors Association (OCVA) honored Newport Beach & Company president and CEO Gary Sherwin with the Legacy Award at the annual Orange County Tourism Conference on May 6. The Legacy Award recognizes a visionary in the tourism industry for contributing to the awareness, positive reputation and growth of tourism in Orange County. Since 2006, Sherwin has led the organization that serves to promote Newport Beach as a premier luxury conference and leisure destination. He was instrumental in the creation of the city’s first Tourism Business Improvement Districts (TBID), as well as a variety of business units – including Visit Newport Beach, Dine Newport Beach, Enterprise Newport Beach and Newport Beach TV – that work in tandem to grow the economic vitality of Newport Beach. Under Sherwin’s leadership, the city has seen a 625 percent increase in conference sales room nights, from just over 10,757 to the projected 2015 goal of 78,000 room nights. In addition to his role as president and CEO of Newport Beach & Company, Sherwin served as the president of the OCVA board of directors for three years, where he played a critical role launching Orange County’s international offices and driving 47.1 million visitors and $10.7 billion in visitor spending to the region. Sherwin is a 24-year veteran of the destination marketing industry who previously held top marketing roles at the destination marketing organization of Palm Springs Desert Resorts, Long Beach and Los Angeles. He co-authored the bestselling book Destination BrandScience in 2005, and is the incoming chairman of Destination Marketing Association International. Past Legacy Award recipients include Henry Segerstrom, Steve Bone, Dr. Robert Schuller, the Walter Knott family, The Irvine Company, Don Hansen, Werner Escher and Judy Bijlani. About Orange County Visitors Association The Orange County Visitors Association (OCVA) is a non-profit organization representing a wide variety of local tourism- related organizations, including accommodations, arts & culture venues, attractions, chambers of commerce, convention & visitor bureaus, retail & shopping centers, restaurants, transportation providers and visitor services. The primary goal of the OCVA is to brand Orange County (The OC) as a premier vacation destination. Learn more at VisitTheOC.com. About Newport Beach & Company Founded in January 2013, Newport Beach & Co. is a non-profit organization established to serve as the official marketing agency for the city of Newport Beach. The agency brings together all of the marketing entities connected to the Newport Beach brand, and is designed to oversee separate business units that include Visit Newport Beach, Dine Newport Beach, Celebrate Newport Beach, Enterprise Newport Beach and Newport Beach TV. Additionally, Newport Beach & Co. includes the Newport Beach Foundation focused on creative charitable endeavors that support the business community.